While Mexican tile is beautiful, it may not be right for you. The bright colors and distinctive tones and patterns can steal all of the attention in a room, making it hard for your furniture and décor items to stand out. If you’re tired of having Mexican tile in your kitchen, bathroom, patio or living room, you don’t have to stare at it any longer. Getting rid of it can be fast and easy with professional help from a flooring service that knows how to remove Mexican tile. Flooring Removal Services is a professional flooring removal company, equipped to help you get rid of your floors as fast as possible. We remove the tile surface and leave you with a clean concrete surface, where you can have a floor you prefer installed. It couldn’t be simpler or easier for you from start to finish. Are You Dreaming of a New Look? Want to change the look and feel of an area in your home or business? If you would prefer a more neutral or modern décor, you have to remove the Mexican tile before you can really see a transformation. The patterns in certain types of tiles are meant to create visual interest, making it hard for anything else in the room to grab the eye of a visitor. Getting rid of Mexican tile can help you transform any room into a peaceful oasis. Once the Mexican flooring tile removal is done, you can have any type of floor put down and create the look you want in your space. Cover the area with wood, carpet or tiles of your choosing to create a look that’s uniquely your own. What Makes Mexican Tile Hard to Remove? These tiles are made to be durable, so they can be hard to break apart. Another reason they can be had to lift is that they are typically installed using mortar. The mortar is spread in a thick layer to help the tiles sit in the pattern they are laid in. In some instances, the mortar can be three inches thick under the surface of the Mexican tile surface. Removing this mortar to clear the way for new flooring is important, but it can also be challenging work. It requires both the right tools and technique to get a good result. With decades of experience, our crews can make sure all of the mortar comes away from the concrete subfloor, leaving it clear and ready for any new surface. Flooring Removal Services has specialized equipment and procedures that make the removal process fast and easy without creating a mess in your home or business. To start, we offer you a customized estimate for the work that needs to be done. By coming to see the project in person, we ensure that you get an accurate price, and that we bring the proper equipment to remove your flooring. Once we arrive to begin work, we start by putting down protective plastic to contain the dust created in one area. We secure these sheets with painter’s tape to make sure the dust stays in. Before bringing in any equipment, we place aluminum ramps to protect against potential damage. Next, we use equipment designed to remove the tile to get rid of the flooring. 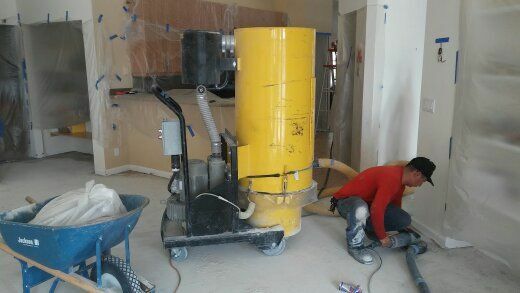 This helps us extract the majority of the Mexican tile floor quickly. Our crews use hand tools to get the rest of the surface removed, including corners and edges. Once the tile surface is gone, we use hand chisels and hammers to remove the mortar, and grind the concrete subfloor to leave it smooth. Our process is not only fast, it is eco friendly. Any debris created as we work is hauled away by one of our fleet of waste trucks for recycling. Dust is contained to keep it from spreading through your home and reducing your air quality. We refrain from using any chemicals or solvents during the removal process, making it safe for your children or pets to be around. There are never any dangerous fumes inside your home. To ensure we leave the air in your home unaffected, we use air scrubbers to remove any dust particles that may have become airborne. We Can Remove Outdoor Tiles Too! If you want to make a change to your patio or backyard, we can perform removal services outside as well! Many outdoor spaces in South Florida incorporate Mexican tile to give the outdoor entertaining space a fiesta feeling. If your style is more contemporary or classic, and you are ready to say goodbye to the Mexican tile, contact us. We can use the same process we do indoors to get the tile removed from your outdoor space. In the flooring removal business, experience is important to ensure success. Knowing how the floor is laid and how to remove it makes the process faster and easier. Flooring Removal Services is owned and operated by experienced professionals with decades of experience. If you’re ready to transform your home by removing the Mexican tile, Flooring Removal Services can help. We can have your Mexican tile removal work completed in as little as 24 hours. Contact us to get a free quote. We are a licensed and insured flooring removal company serving south Florida, including Dade, Broward, Palm Beach, Martin, St Lucie and Indian River Counties.